Our Sunset Hills MO orthodontist understands that investing in your smile through Invisalign can come with many questions. Read on for 5-star answers that will help you become more familiar with Invisalign treatment. Our Sunset Hills orthodontic office invites you to schedule a consultation if you’d like to find out if your smile qualifies as a candidate for Invisalign! A: Invisalign is a virtually invisible alternative to braces. Thermoplastic aligners are designed to fit the specifications of your smile. 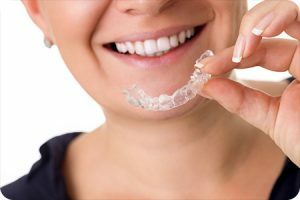 Your orthodontist in Sunset Hills will take impressions of your bite, and these measurements will be used to make your Invisalign trays. These clear trays will gradually move your teeth into the desired position. Your trays will typically change every two weeks. A: Treatment length will vary based on the needs of your unique smile. Our top-rated Sunset Hills orthodontist will provide an estimate as to how long your specific treatment will take. To ensure that your smile stays on track with the projected time, our orthodontist in Sunset Hills MO recommends wearing your aligners at least 22 hours a day. A: Since Invisalign treatment uses clear plastic aligners to straighten your teeth, no rubbers bands are needed! In rare cases, however, your orthodontist in Sunset Hills may recommend that you wear rubber bands in addition to wearing Invisalign. Orthodontic rubber bands are designed to fix your bite rather than the alignment of your teeth. Small fixtures for the rubber bands to cling to can be glued to your teeth when wearing Invisalign. The bite-fixing phase of orthodontic treatment can take the longest. If you are prescribed rubber bands, our 5-star Sunset Hills MO orthodontist recommends wearing them as faithfully as possible. This will help to ensure you do not have to wear them longer than anticipated. The information provided in this article is not meant to be medical advice and is for educational purposes only. If you would like to learn more about this and other topics related to orthodontics, feel free to contact Borello Orthodontics, with a convenient orthodontic office location near Sunset Hills MO, by clicking here or by calling 314.821.2400.